Fault current limiters (FCLs) have the potential to significantly improve power system stress in locations where fault current levels are expected to rise beyond the permissible range of surviving circuit breakers. Today’s superconducting materials can meet the performance necessities of power system machineries. As a result, a major portion of FCL designs use superconducting materials to complete the limiting action. Superconducting fault current limiter (SFCL) technologies continue to make progress toward commercialization. Power utilities worldwide deal with the issue of growing levels of fault current resulting from several occurrences which leads to higher adoption of SFCL limiters. The market is projected to expand at a CAGR of 8.2% during the forecast period and reach US$ 6,120.4 Mn by 2026. Superconducting fault current limiter (SFCL) offers numerous benefits to electric utilities and their systems. For instance, manufacturers spend millions of dollars each year to maintain and protect the grid from potentially destructive fault currents. These large currents can degrade or damage circuit breakers and other expensive system components. Manufacturerscan decrease or abolish these replacement costs by connecting SFCLs. Also, governments have taken an initiative to increase or renovate power grid systems with fewer circuit breakers and fuses used in transmission & distribution systems. This will help to drive the superconducting fault current limiter market. Rise in demand for updated power grids and the general preference for renewable energy applications is increasing the demand for superconducting fault current limiters. Companies’ are concentrating on developing countries, which in turn is predicted to provide ample expansion opportunities to the superconducting fault current limiters market. Manufacturers are installing SFCL in power systems to increase efficient power supply in many developing countries. Industrialization is a key factor directly affecting the superconducting fault current limiter market as demand for efficient power supply is increasing within several industries due to growing short circuits in power plants. Moreover, growing demand for electricity particularly in developing and underdeveloped countries due to rapid industrialization and the increasing usage of renewable energy for the sameis facilitating the growth of superconducting fault current limitersin industries. In the global superconducting fault current limiter market, shielded core SFCL is expected to be the preferred type across the world. Shielded core SFCL has advantages such as the fact that no current leads are needed, and the number of turns of the secondary winding can be much smaller than the primary turns. Although resistive SFCL is expected to substitute shielded core SFCL in a few applications, it is anticipated to maintain its dominance in power transmission and distribution network that make up more than half of the global superconducting fault current limiter revenue. High electrical conductivity, durability, ability to undergo stress with minimum signs of wear and tear, and superior ductile makes shielded core SFCL an irreplaceable type in the superconducting fault current limiter market. Attracted by this expanding market and underlying latent demand, several players are expanding their business through strategic mergers and acquisitions and partnerships with several end-use industries.For instance, in September 2017, American Superconductor Corporation acquired Infinia Technology Corporation (ITC), a cryo-cooling company located in Washington, U.S. for US$ 3.75 Mn to complement its grid business. Also, Siemens has used superconductors in building a power grid in Augsburg. 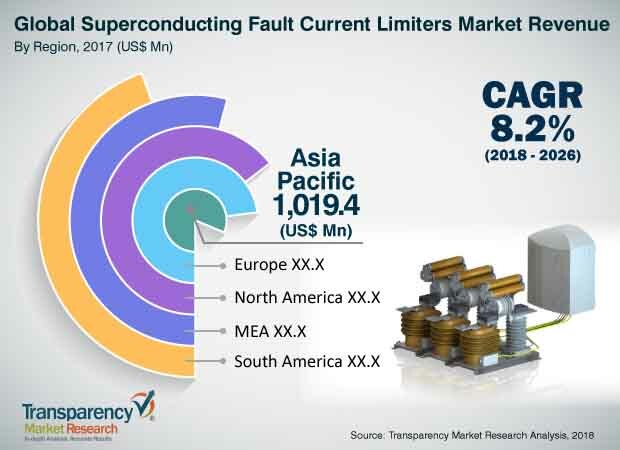 Some of the prominent players identified in the superconducting fault current limiter market includes - ABB Ltd, Siemens AG, Toshiba Corporation, Nexans, Furukawa Electric Co., Ltd, Applied Materials, Inc., Northern Powergrid, Superconductor Technologies, Inc, and American Superconductor (AMSC). This comprehensive report by Transparency Market Research analyzes and forecasts the superconducting fault current limiter market at the global and regional level. The report provides analysis over the period 2016–2026, wherein2018 to 2026 is the forecast period and the base year is 2017. An in-depth and unbiased market assessment has been made to offer readers in-depth and accurate analysis. The report highlights all the major trends and services playing a key role in the growth of the superconducting fault current limiter market during 2018 - 2026. It also focuses on market drivers, restraining factors, and opportunities of the superconducting fault current limiter market during the said period. The study provides a complete perspective about the market throughout the research study in terms of value (in US$ Mn) across various geographies, including Asia Pacific, South America, North America, Middle East & Africa (MEA), and Europe. The report includes a detailed value chain analysis, which is focused on providing an extensive view of the global superconducting fault current limiter market. Porter’s Five Forces Analysis is also provided in the report to understand the competitive scenario in the market. The study incorporates market attractiveness analysis, wherein the market segments for type and end-use industry are benchmarked based on their market size, growth rate, and attractiveness in terms of opportunity. In order to offer a complete analysis of the overall competitive scenario in the superconducting fault current limiter market, every geographic region mentioned in the report is provided with attractiveness analysis. A market overview chapter in the superconducting fault current limiter market report explains the market trends and dynamics that include the market drivers, restraining factors, and opportunities for the current and future superconducting fault current limiter market. A market outlook analysis has also been provided globally in the report. Additionally, the report provides analysis of different business strategies being adopted by market leaders of the superconducting fault current limiter market. The market introduction chapter helps in gaining an idea of different trends and services related to superconducting fault current limiters along with their devices. The study provides a decisive view on the global superconducting fault current limiter market by segmenting the market based on type and end-use industry. The report provides a detailed breakdown of the superconducting fault current limiter market in terms of region and categorizes it at various levels, thus providing valuable insights at micro and macro levels. The report further highlights the competitive scenario within the superconducting fault current limiter market, thus ranking all the major players according to key recent developments and their geographic presence. The insights for the superconducting fault current limiter market are the result of our extensive primary interviews, secondary research, and in-house expert panel reviews. These market estimates have been analyzed by considering the impact of different economic, political, social, legal, and technological factors. On the basis of country, the North America market is bifurcated into Canada, the U.S., and Rest of North America. The Europe market is analyzed across Italy, France, Germany, U.K., and Rest of Europe. The APAC superconducting fault current limiter market is also segmented at country level which includes China, Japan, India, South Korea, and Rest of Asia Pacific. Middle East & Africa region covers the GCC, South Africa, and Rest of Middle East & Africa. Similarly, South America region includes Brazil and Rest of South America. This report provides all the strategic information required to understand the superconducting fault current limiter market along with its devices and application. Also, the report provides insights related to the components and different applications according to the various geographical regions mentioned above. Primary research involves telephonic interviews, e-mail interactions, and face-to-face interviews for detailed and unbiased reviews on the superconducting fault current limiter market, across geographies. Primary interviews are usually conducted on an ongoing basis with industry experts and participants in order to get latest market insights and validate the existing data and analysis. Primary interviews offer new and fresh information on important factors such as market trends, market size, competitive landscape, growth trends, etc. These factors help to validate and strengthen secondary research findings. Moreover, the data collected and analyzed from secondary and primary research is again discussed and examined by our expert panel. The research study includes profiles of leading companies operating in the global superconducting fault current limiter market. Market players have been profiled in terms of attributes such as company overview, financial overview, business strategies, and recent developments. The key players profiled in the global superconducting fault current limiter market includes ABB Ltd, Siemens AG, Toshiba Corporation, Nexans, Furukawa Electric Co., Ltd, Applied Materials, Inc., Northern Powergrid, Superconductor Technologies, Inc., and American Superconductor (AMSC). These companies are focusing on expanding their business through strategic acquisitions and partnerships with several end-use industries.